I'm a Bible-believing mom of three teenagers, married for over twenty years, and a three year survivor of follicular lymphoma. I keep getting monstrously good ideas to blog about, but then I think...Oh, I should post pics with it, and time at home now is so limited, I keep putting it off. But things are happening here, often too much at a time. I did a craft show at Mt. Zion last Saturday, and did really fairly well. D stayed with me all day, and made some great suggestions. I should remember more often that he actually does have a degree in business management. Of course, have multiple price points helps a lot. A lady near me had a booth with only a few items in it -- carefully hand-quilted items, but pricey. I'm absolutely sure they were worth every dime, but a lot of people just browse at shows, they're really not ready to lay out a hundred bucks or so, especially in this economy. She was frustrated by the end of the day with her lack of business, and kept coming over to my booth to stare at my repurposed paper jewelry and buttons, which were selling like mad, and kept muttering, "It's just PAPER!" I felt bad, but I didn't know what to say. 'Green' sells. And inexpensive sells. People can walk away with a piece of cute jewelry that is recycled from vintage comic books (I would say fairly unusual) and they haven't gone broke. Don't come to my booth if you're wanting the Hope Diamond, or pure gold. But if you're into kitschy and vintage, I'm your woman. I'm working like mad to replace product since I have another show in a week and a half. Crazy, I know. But I'm determined to get back to a semi-normal lifestyle and actually have a life outside school, not just be bedridden all the time. God willing. For Valentine's Day, D drove two hours to St. Louis to take me to Whole Foods for wonderful shopping. It is such an amazing place, full of interesting things we can't buy around here. We bought blood oranges -- wondrous tangy goodness -- and Meyer lemons. The cheese 'island' guys are so informative, and we bought an embarrassing amount of different cheeses. I bought some goat cheese and spicy mustard to take to German class. A lovely Lebanese man was giving us samples of feta cheese, and olive matta on pita bread, which we devoured and, of course, bought everything. Balsamic vinegar and feta cheese are wonderful. When we were in line, a man with two cases in his cart went on and on about the astoundingness of kombucha tea, and how it was 'the only live thing here', and we HAD to taste it. D got a green tea, and got me a cranberry juice. When he looked at his bottle, there was sediment in the bottom and he started to shake it. The man and another random woman in line flipped out and started shrieking 'Don't shake the bottle!' Apparently the woman had had a bottle explode, popping the top off, and breaking the GLASS bottle. When we got to the car, D was too afraid to actually drink his, since it was practically breathing and foaming at the mouth. I took one mouthful of mine and my tongue went numb. D read the label and the first ingredient was blue-green mountain algae -- ALGAE!!! There was supposed to be 1 billion lactobacillus organisms and 1 billion other organisms. I don't think I need 2 billion more organisms inside me. D threw his out, but I brought mine back, just to prove it to the kids. We also bought all kinds of exotic chocolate (D put his next to his chair and Grace ate it) and fancy soap for S.
All in all a great trip -- we even cruised through The Container Store. Amazing how many boxes and shelves people can think up. My soft-hearted daughter, who would rescue any stray puppy/kitten/turtle she happened to see, has brought us two foster cats. Their owner has had a terrible run of luck. She was in a car wreck, and her apartment burned, so her two cats were homeless. Her renter's insurance paid for them to be boarded at a vet's for a few weeks, but the money ran out. So we are hosting Mouse, a gray and black tabby male who is absolutely huge. He also hates us. He is very vocal about his unhappiness, also. Then there's Missy, a black shorthaired female who is terrified and hides under anything she can get under. Right now we're just letting them have their space and waiting for everyone to settle down. Mouse has already had two run-ins with Grace, our pit/Rottie mix, who is extremely nosy and ungraceful. She just wants to play, but he's not having any of it. Hopefully this is a short term foster. David is being wonderfully gracious at this unexpected turn-up -- thank you, lovey!! I suddenly decided I needed to share the recipe of the cookies I was making with the world. It makes a huge amount of wonderful cookies, and is extremely easy to make. I printed it off allrecipes.com years ago, but have modified it to my family's tastes. Drop by tablespoonfuls onto prepared cookie sheets. Bake for 11 - 13 minutes until edges are golden brown. Perfect for cold winter days! Yes, I'm still here, like Granny Weatherwax. (Any Pratchett lovers out there?) A combination of too much stuff to do and too little energy to do it with has kept me off my blog. I keep thinking of things to put on here, but.... I have made chocolate chip oatmeal cookies this afternoon, so I haven't been completely useless today. And took J to buy a new suit for homecoming. Boys grow entirely too fast, in my opinion. The only crafty thing I've done lately is print out cute labels for the little notebooks I bought for our upcoming craft night. I even bought cute pencils to go with them. I do need to get publicity going, which is my weakness. I really don't like talking to strangers...I tend to stammer and sound like an idiot. If I have successfully added an image, you should see a Pantone color swatch -- turquoise, which they have announced as THE color for 2010. 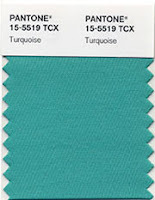 Personally, I think it's more teal than turquoise, but that's me. A darker tone, certainly that what reigned in the late '80s, because I remember a friend's teal and peach wedding. It was...certainly interesting to look back on, and that's all I'm going to say, because I was the one who chose a lavender and purple wedding scheme. Of course, there are few bridemaid dresses that would stand the test of time from the era I grew up in. Today's choices are much more usable-for-all-occasions, I think. I heard a new term this past week: Dracula sneeze. It was on a podcast, Way with Words, and describes the act of sneezing into one's elbow joint to contain the sneeze without contaminating your hands. So you look like the old-time Dracula raising his cape, I guess. And they also said that people are calling the swine flu, the hiney flu...H1N1...get it? So in that vein, I took a quiz on a site K sent me. The result? I have way too many germs on my cell phone. I definitely need to go clean that thing. Ick.